Can a blockchain-IoT hybrid finally give us smart guns? Over the last 20 years, technologists have been working hard to create solutions to the challenges of gun safety. Their efforts have kept pace with the technological developments of Bluetooth, Wi-Fi, sensor technology, wearables and IoT. Yet their implementation has been slow, if not stalled to a halt. I wanted to look at the pain points in this trajectory and how and when it could move forward. I also spoke to one person who believes the blockchain could solve some of the back-end structural challenge: Kevin Barnes, founder of the Blocksafe Foundation, who is also a 20-year US Army veteran as well as architect and coder. But first, let’s delve into guns before we explore the inclusion of the blockchain. In April this year, President Obama made funding for smart gun research part of his end-of-term efforts. The smart gun promises a technological fix for gun violence by keeping firearms out of the hands of people who shouldn’t have them — thieves, children, and anyone else who isn’t the authorized user. A smart gun is a firearm that includes a safety feature or features that allow it to fire only when activated by an authorized user. These safety features can prevent misuse, accidental shootings, gun thefts, use of the weapon against the owner, and self-harm. 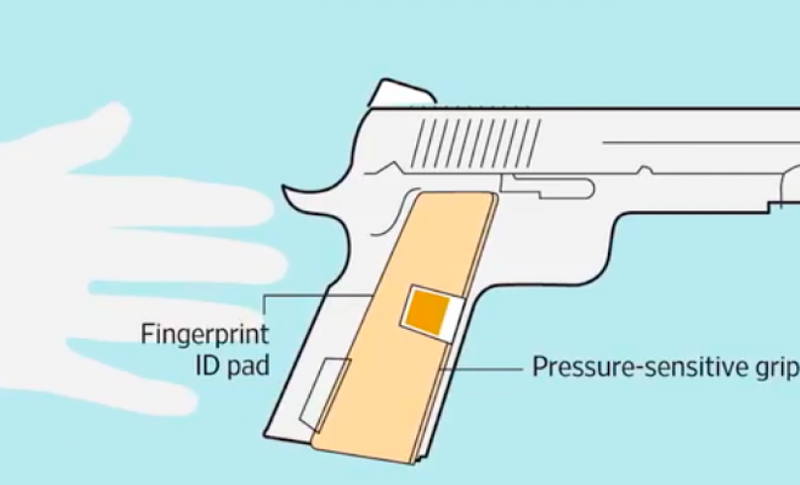 Smart guns distinguish between authorized users and unauthorized users in several different ways, including the use of RFID chips or other proximity tokens, fingerprint recognition, wearable devices, or mechanical locks. For those of us born outside of America, it’s hard to imagine the notion that smart gun development has been thwarted by politics and political lobbying and an underlying concern that their introduction would lead to stricter gun control. But it’s the strange reality. In 1999, gunmaker Smith & Wesson promised the Clinton White House to develop smart guns that can be fired only by the adults who own them as part of a deal to fend off liability litigation. The gun lobby organized a boycott against Smith & Wesson, perceiving smart guns and other concessions in the deal as part of the gun control agenda. Factories closed, employees were laid off, and for some time, big U.S. gunmakers avoided smart guns. The boycott stemmed from fear that smart guns would soon be the only guns people were allowed to buy, infringing on individual’s rights bear arms of their choosing. Gunmakers Colt received a $500,000 grant from the Justice Department in 1997 to complete development of a handgun that would work with RFID via a wristband. Smith and Wesson received more than $3 million in Justice Department grants between 2000 and 2004 to develop smart guns for law enforcement. The prototypes were completed but no one was using them and Smith & Wesson had to layoff 15 percent of its staff due to boycotts. In 2014, when Engage Armament of Washington shared their intentions to sell the German Armatix iP1 .22-caliber handgun, which electronically limits the ability to fire the weapon, the shop received thousands of complaints and threats of violence and death, forcing them to reconsider their decision. The Armatix gun is implanted with an electronic chip that allows it to be fired only if the shooter is wearing a watch that communicates with it through a radio signal. If the gun is moved more than ten inches from the watch, it will not fire. In New Jersey, lawmakers passed a 2002 law requiring that guns be “smart” once they have been available on the market for three years. That three-year countdown has never been started in part because of pressure from gun rights activists on manufacturers not to develop the technology. This week California congressman Rep. Mark DeSaulnier, submitted the Modernizing Firearms Technology Act to Congress. The bill would require gun retailers to display at least one personalized firearm and make it available for buyers who are not prohibited by law from possessing a handgun. If licensees don’t, they would incur a $1,000 annual fine. A blockchain-based system provides the ability to enable, disable, track and secure firearms without any centralized control or reporting according to Barnes. Blocksafe is primarily a software-based project, providing the infrastructure to support the smart-device hardware that manufacturers and 3D print projects use to enhance the safety and defense capabilities of firearms. It’s a peer to peer network that uses a combination of lisk, BitTorrent and Telehash. 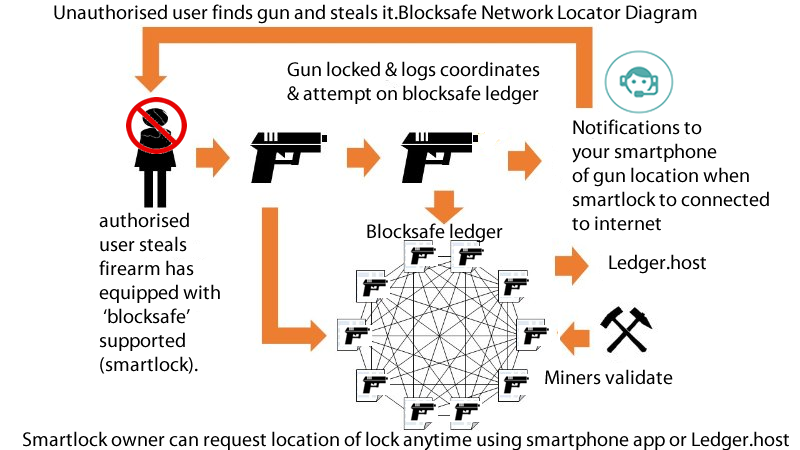 In basic terms, when a gun fires, the Blocksafe “shotspot” technology senses and logs details on the Blocksafe ledger. Notifications simultaneously go to emergency personnel. Multiple “shotspots” work together to detect, locate and respond to gun discharges. When setting up a smart device initially, Bluetooth authentication is setup via the Blocksafe app by the owner and all authorized users are added by the device owner and stored on the local ledger. Authentication method could vary upon the device and manufacturer. A gun’s round count and authentication attempt parameters are stored in real time along with other data that the device owner chooses to be recorded such as date, time, and location using encryption onto the local ledger of the device. When the device has internet access the ledger is synced to the network and the device owner receives notifications such as push, sms, or email as configured by the owner’s chosen device settings. The data is encrypted via a data key on the network. So, only those who have the data kept from the device owner will be able to view the actual device activity. The technology will include locks that mount on the gun. Barnes said they are developing custom prototypes of smart devices, but their bigger focus is on developing and maintaining the Blocksafe network and infrastructure. Blocksafe will provide SDK, API and support for other manufacturers to use the Blocksafe network. “The stakes are too high for a hackable, controllable third-party solution,” Barnes said. “We believe that an anonymous, secure and decentralized infrastructure must be in place to reduce gang activity, locate stolen firearms, and prevent guns from being used against owners. These advanced features can save lives and our right of self-defense. At time of interview, Barnes was in discussion with the Smart Tech Foundation to look at collaborative opportunities. Whilst it seems unlikely that smart guns will ever replace traditional guns outright unless the legislature can be stronger than the lobbyists, the reality is that they could significantly advance gun safety into the future.